Easy recipe for my Mom’s pot roast. It’s a from scratch recipe that is perfect for Sunday Supper or a weeknight meal. Comes out perfect every time! When I think back to my growing up years, some of my best memories are of being in the kitchen with my Mom. She was a very basic (but oh so good) cook. She made her own homemade noodles, pies from scratch and the most amazing chocolate chip cookies you ever tasted. She fed our family of six, every day and on one income. One of her specialties was Pot Roast. My mom’s pot roast is a meal that will feed a crowd but is so easy. All you need is a good cut of meat and some time. It would be hard for a working mom to make this during the week…but if you want an awesome Sunday Supper without spending all day in the kitchen, then this is for you. The secret to pot roast is to cook it low and slow. If you do, the meat absolutely melts in your mouth. You can actually add as many carrots and potatoes as you want. If you don’t want them for leftovers, simply add what you think your family will eat. On its own, the leftover meat is delicious when shredded and served on fresh hamburger buns. Drizzle a little of the juice over the meat for added flavor. Easy recipe for my Mom's pot roast. It's a from scratch recipe that is perfect for Sunday Supper or a weeknight meal. Comes out perfect every time! In the bottom of a very large pan over medium heat (on the stove top) generously drizzle olive oil. Lay the chuck roast in the pan. Let it brown for about 3 min. and then turn. Cook again for 3 min. Add enough water so only about 1/2 inch of the roast is showing. Do not cover the roast with water. Cover pan and cook in 325 oven for 90 min. Clean the potatoes and cut into quarters. Set aside. At the 90 min. mark remove the pan from the oven. Add potatoes, carrots and onion. Make sure your roast is still showing above the broth. Cover and return the pan to the oven. Speaking of leftovers, they are outstanding. My Dad says that my mom’s pot roast is actually better the second time around. I put the leftover meat and vegetables in a glass covered casserole dish. I add the leftover juice so everything is covered. To reheat, just put the whole thing in the microwave. This granite ware covered roaster is currently on sale for a great price! Just wanted you to know, Ann, your Mom’s pot roast was a hit with my family! We were snowbound over the weekend. The whole family had come over for Saturday night dinner. We were supposed to get one or two inches of snow, but instead got seven or eight inches with lots of drifting. No way to get down our country lane that night. So all four adults and seven children spent the night. I had no idea what to feed them the next day. I found a large chuck roast in my freezer and found your recipe I had saved on a Pinterest board. It was great because it didn’t require lots of fancy ingredients I didn’t have on hand. It was also delicious! Threw in some vegetables, made biscuits and my family loved it! Thanks so much for this yummy recipe and saving me on a snowbound day. I’ll be making it again. Btw, we had such a fun snowbound weekend, and made lots of special memories! This sounds really good. My mom was a stay at home mom and made a great meal every night. There was always a meat or casserole, salad and at least a veggie or mac & cheese. I wish I not taken this for granted. I can really appreciate it now. I loved the beauty of your herb garden! I believe I have a basket just like that in my basement. Lucky me! Ann, thank you for sharing this simple recipe, yet it looks comforting. I agree, I use broth instead o f water for added flavor. I used to make pot roast pretty much like that. But in the last couple of years, I have been using beef broth instead of water. WOW, what a difference it makes to the gravy and richness of the meat! This is my first comment to anyone on bHome. I am so glad you did join. I had just started following you and liked your simple, fresh style, your lovely front door and your friendly comments. Because of you I joined bHome and have found some wonderful new sites to follow and be inspired by. So thank you for taking a step of faith. I love the community aspect of bHome and I know that now a lot more people will discover you as well. God bless. 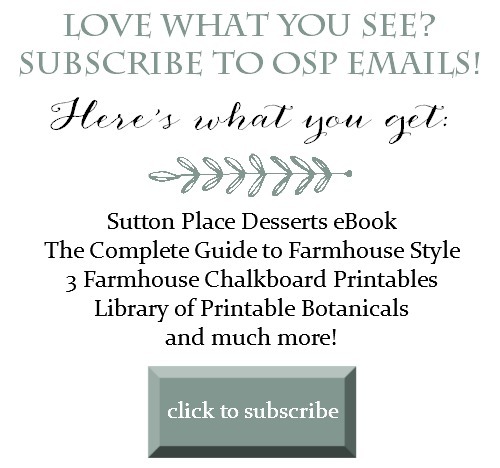 I don’t have an IPhone or I Pad, but look forward to your post here, I love your decorating ideas and copy all your recipe’s. I hope you keep your web site here. Ann, this recipe is almost the same as my mom’s and is the best comfort food there is. My mom added marjoram, thyme and a bay leaf to her pot roast and then made a gravy to serve with the veggies. In our house we used horseradish as the condiment. I think the women who learned to cook around the Depression and WWII years knew how to make families appreciate what they had. As always, love everything about. OSP. I’m in total agreement with your response. Miss my mother and her cooking! Love your stories, creations and recipes! How about your Mom’s chocolate cookie recipe? This recipe sounds amazing! I have 7 grown children, and although I cooked dinner every single night when they were growing up, I am not a good cook at all. I think even I might be able to manage this delicious sounding recipe! Do you cut the meat in slices to serve, or are the pieces more like chunks? Hi Alice! I bet you are a great cook…the meat is so tender it doesn’t really slice. It falls apart in chunks. Enjoy! I signed up and look forward to your helpful hints on how to use the app. I am having some difficulties, but sure I’ll learn. I was excited to read your post as I had made pot roast yesterday, so I was eager to compare (born and raised in Hungary we like to think of ourselves as good cooks). I pretty much made it with the same ingredients, but I made it in a crockpot as we spent our day getting the garden ready and this way it did not require our attention. I also inserted a sharp, narrow kitchen knife into the roast 5 different places and inserted segments of garlic deep into the meat for extra flavor. No one was complaining :) Thank you for sharing this with us. This was a staple meal growing up for me as well. I grew up in New England and good hearty meals were a constant. I still like this at least once a month and even though the hubster and I both work, we make it do. We put it in the crock pot. The meat almost melts in your mouth. Thanks for sharing! I make my mom’s pot roast to this day….the only difference is that I do it in the crock pot…your mom’s and my mom’s recipes are very similar….and yes, our mom’s certainly made the best food. She calls it “no fancy food” and fed our family of 7 on a tight budget, and as you know, you would never know it from their wonderful meals. The pot roast looks awesome and mouth watering, reminds me of Sunday dinner at my grandmothers house. It is really too bad that we are so busy in our lives we don’t have time to do the things our parents or grand parents did. Your dad is so right, pot roast as well as some other dishes like spaghetti are better the next day. Thanks for the recipe. So true that simple cooking is the best. I find that browning of the meat makes a big difference. When I have time, I like to brown the onion and the carrot too. I also like throwing in a sprig of fresh rosemary (the only herb that survived my gardening endeavors). I’d like to try the beer suggestion. Leftovers is my favorite part, I am convinced they test better the next day. And the leftover gravy can be frozen and then made into a beef and veggie soup. Boy..I should put a pot roast on the menu for next week. Wow Ann! You and your site are such a breath of fresh air. I have always enjoyed crafts of all sorts, I adore flowers and I so love a beautiful cozy home…I like to dabble at decorating. For someone like me you are better than shirt pockets. I had to give up working a couple of years ago due to health concerns so I have a lot of time on my hands. I spend long hours browsing your site. Thank you for taking the time to comment! I am happy you are following along and hope you are well. oh, the memories! amazing, isn’t it? nothing better than a pot roast! Sometimes I put cauliflower in with the potatoes and carrots ….. and they are so good! Thank you, Ann! 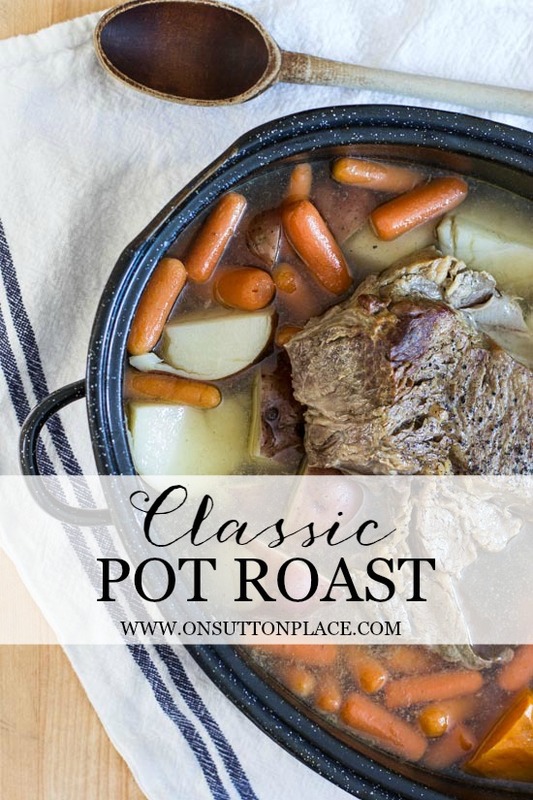 Pot roast was always my mother’s specialty, too, and she cooked it almost exactly the way your mother did! I even have her pot that she cooked it in, and I call it “My Magic Pot!” I haven’t found a person yet who doesn’t like the roast that comes out of it! Had house fire in2013,lost lots of my mom’s recipes.ThankYou Ann! For this one.mom did it very similar but added chili sauce today’s “ketchup” on top last half hr? Was divine..I went to grocery store 1 hr ago,your version in my oven as I write ..can’t wait! Hi Mary! I hope you enjoyed your pot roast…I am so sorry about the fire too. I’ve never heard of the chili sauce trick. I just may try that! It was Perfection in a pot…I did not do the chili sauce wanted your mom’s way..it was worth the wait as the house smelled of childhood memories…who says you can’t go back? my 23 y/o son devoured it,said it was best thing I made this year! ( Gotta love’em! ). Your pot roast sounds wonderful. I love a good pot roast! NUMMO!!!! Thanks for the great memory. My mom made the best roast and when $ allowed she cooked both a pork roast and beef roast together….oh I can taste the gravy. I’m happy to read you are also keeping your blog alive the traditional way. I do have an ipad but find it easier to read posts on a traditional computer. I need to visit bhome and see if I can navigate it. Hope its user friendly. Oh I love pork roast too so doing that and a beef roast together sounds amazing. Thank you! It seems the way to cook pot roast,back in the day,was long and slow. My mom made the best. You could cut it with a fork. I tried the oven method but it was never the same. Now I cook it in the crockpot and it turns out very tender. Thank you for the good memories, Ann. I have the same roast beef memory and seemingly the same recipe. My grandmother lived with us and she would put this in the oven before church on Sunday morning. We would come home from church to that wonderful aroma. Now I do the same except in the crockpot over night. It’s my family’s favorite meal. My grandchildren especially love it. Love the recipe I remember having pot roast on Sunday’s after church for years. My Mom would start the meat in the morning, and just have to add the potatoes and carrots after we got home from church. Wonderful Sunday’s at home, Wonderful bHome post, and I am trying it, but I am so glad you are continuing this lovely blog. Your home is lovely, and I so enjoy all your posts. Happy Snowy Sunday! Your timing of this post was perfect, thank you! This brings back memories of my Mom…..& how much I miss her. I make this all the time & it is delicious. i will definitely try this recipe. i have a roast in the freezer for it. sounds yummy. thanks ann. enjoy ur site very much. 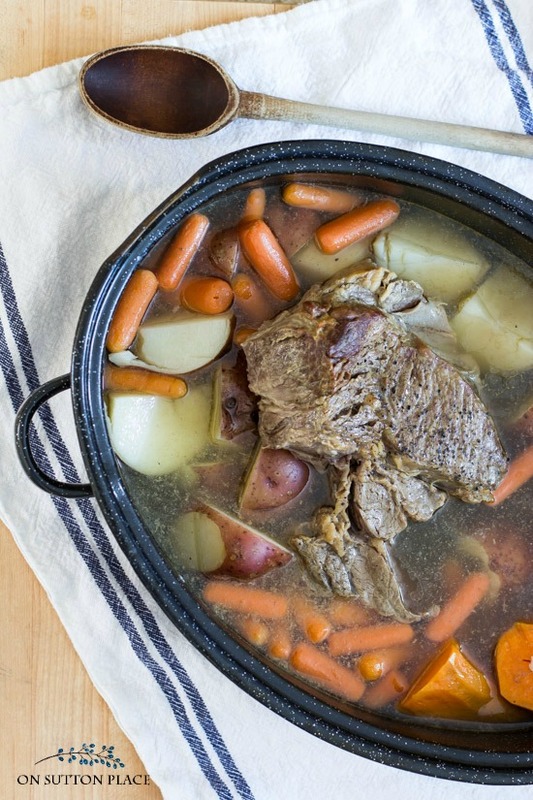 I love this pot roast post as a reminder of family eating together, Ann; when I was a kid before our mom died, in my own home with kids and especially at my in-laws. Thank you, God bless, and enjoy your new venture! Ann, this is exactly the way my mom cooked her roast and I followed. It is delicious and you are right, it will melt in your mouth! I don’t think this roast could be improved! It’s a keeper! BTY—I love the new bHome! What a nice place to scroll and relax!!! Ann — BHome is pretty wonderful and it gives me a delightful new way to use my iPhone. I have explored many blogs; yours and Savvy Southern Style are my favorites — imagine my delight to find both of you on BHome, too! It’s all good. Thank you for all you share with us — it is appreciated so much. I love your home! First…I love bhome! I can access your great ideas and inspiration much faster and it keeps me more organized. Second, I enjoy the peek at the other blogs and can keep track of my favorites. Thanks for taking the leap! Now..I can’t wait for the All things SPRING! I am making this version of Pot Roast on Thursday. I can tell by the other comments, it will turn out fine. I have not eaten meat in about 10 yrs, but Pot Roast is my son’s favorite and I make it for him once or twice a year. I am so happy I found OSP, I enjoy it everyday and learn many new design tricks. Many thanks. I think everyone is looking forward to the PotRoast!